There’s nothing quite like gathering your loved ones together and celebrating the holidays with good food and good company. However, hosting isn’t always easy and can transform what should be quality time with friends and family into a stressful nightmare. Fortunately, there are plenty of tasks you can cross off your to-do list before guests start arriving so you can relax and enjoy your holiday. 1. Keep the guest list manageable. Don’t invite more people than you can manage. Consider how much space you have for hosting in general and for seating. If you have more people than will fit at your table, what’s your plan? Will you set up extra tables? 2. Make a list of what you need. Once you know how many people are coming to Easter, take an inventory of your plates, forks, knives, serving dishes, cups, etc. If you need extras, borrow some! Ham and lamb are the Easter meats of choice for a lot of people, but when planning your menu, keep dietary restrictions in mind. Including a quiche or galette alongside your other choices will provide a tasty option for any vegetarians in the mix. No one ever said you can’t set the table the day before Easter. 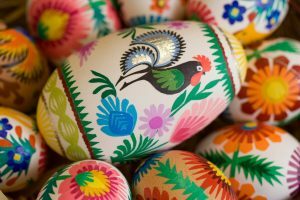 Complete this time-consuming task early to free up time and mental energy for other tasks that will need to be done on Easter. Remember that, when all is said and done, Easter is a time to come together. Don’t stress over the small things. Enjoy this special time with your friends and family. Do you have any questions about buying a home or selling your home? It’s going to be a busy spring! If you’re thinking about buying or selling, let’s get started. Connect with us today at 307-635-0303 or online at CheyenneHomeStore.com.